Overview… a lawyer from Brooklyn who just passed the bar exam six weeks ago, after years of failed attempts. Now, he must throw himself into the most important case of his life – it just also happens to be his first. 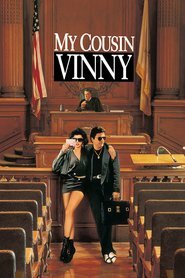 Out of his element in a rural Alabama courthouse, fast-talking Vinny puts on quite the tough guy façade in order to mask his discomfort and inexperience and save his cousin and cousin’s friend (the defendants) from serious jail time for a murder they didn’t commit. Vinny wants to win the case without the help of anyone else, even – or especially – his smart, sarcastic fiancée, Mona Lisa. Personality… defensive, proud, and clever. Vinny loves to argue, and he’s amazing at it, which is why he went to law school in the first place. But while he can always find the flaw in his opponent’s argument, he’s not as adept at picking up on social formalities. Still, he wants more than anything to win this case for the sake of his innocent cousin and for his own ego. But he doesn’t like when his shortcomings are exposed – often by Mona Lisa – along the way. Vinny Gambini's popularity ranking on CharacTour is #2831 out of 5,000+ characters. See our top-ranked characters and read their profiles.